Jonathan Rea took a win and a third place at the World Superbike round at Assen, while Eugene Laverty twice crashed out without injury. Rea took the final podium place in the red-flagged race one and then mastered the treacherously wet conditions best to win race two, run over 10 laps. The Pata Honda rider now has five career successes at Assen and 12 World Superbike race victories to his name. The Northern Ireland-born rider lies fourth in the series with 89 points. Reigning world champion Tom Sykes heads the standings on 108 points, followed by Frenchman Sylvain Guintoli on 96 and Loris Baz on 93. Aprilia rider Guintoli won the day's opening race, with Yorkshireman Sykes second on his Kawasaki. Crescent Suzuki-mounted Laverty fell victim of the damp track when he took a tumble while lying eighth. Race two was halted because of standing water on the track, with Rea lying in second and Laverty ninth. After a lengthy delay, the decision was made that conditions had improved sufficiently to allow a re-start, run over a reduced distance. Rea produced a commanding performance to lead throughout, his position at the front strengthened when nearest challenger Guintoli crashed out. Laverty slid off with three laps remaining as he again occupied ninth place. 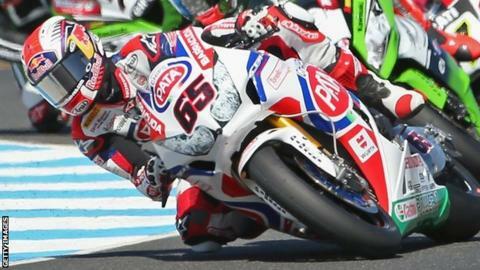 Alex Lowes ended up second, 2.22 seconds behind Rea, followed home by Davide Giugliano in third and Sykes in fourth. "The hardest part of the day was waiting in the garage during the delays," admitted a jubilant Rea after race two. "It's great to win at the team's home round - they gave me a great bike to ride in the wet conditions."